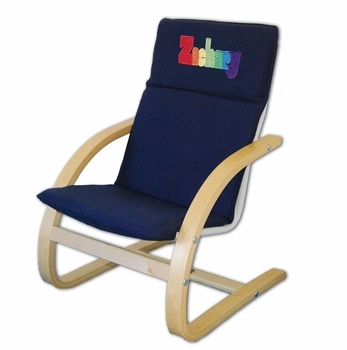 This personalized child’s chair is made with a sturdy bentwood frame and measures 17 inches wide, 18.5 inches long and 25 inches high. It makes a great newborn or first birthday gift. The maximum recommended weight is 100 lbs. We personalize the back of each chair with a stunning embroidery of the child's name making this a lasting remembrance and a very unique bestowal. Available in dark blue or red with up to 8 letters in bold primary colors. There is also an optional matching side table available to create a very cute ensemble. Click on More Images above to see pictures of this item in red and the side table. Allow approximately 2 weeks for delivery. Processing Time Approx. 2 weeks. Does not include shipping time. Personalization process on this product requires longer period of time and totally worth the wait!